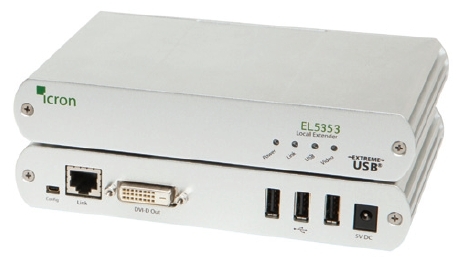 The EL5353 KVM Extender System features the latest and most robust HD video and USB extension technology from Icron Technologies. The EL5353 extends both DVI and USB 2.0 applications up to 100m over a single CAT 5e/6/7 cable. The EL5353 KVM Extender lets you place a computer up to 100m (330 ft) away from a workstation using a single CAT 5e/6/7 cable. The system supports full HD video and USB 2.0, providing the ability to control keyboards, mice, flash drives, audio peripherals and other USB 2.0 and 1.1 devices. Note: Maximum distance and product performance will be reduced in the presence of interference or coiled extension cable.